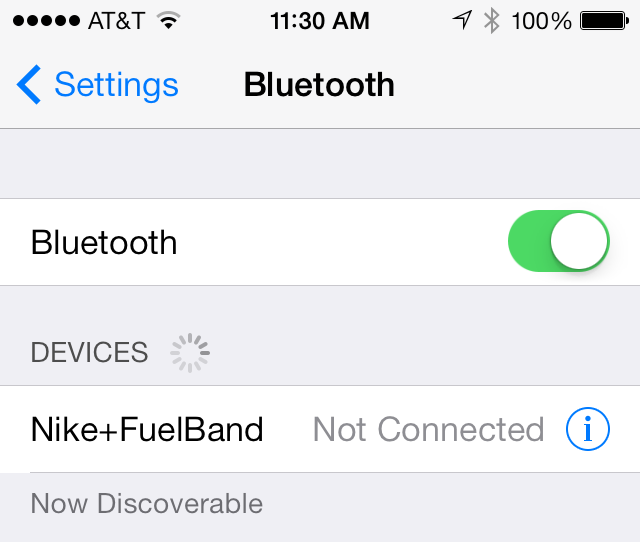 If you're like me and you have a Nike+ FuelBand (and after the release of the Nike+ FuelBand SE on Tuesday I guess we could say the OLD Nike+ FuelBand) and you sync it with an iPhone, you might be experiencing a few problems with getting your FuelBand to sync with your phone after the latest update to the app. Because I spent an annoying amount of time trying to get this to work again, I thought I'd list out all the steps in case there are others out there experiencing the same problem (you go to sync your FuelBand witht he app and nothing happens...). 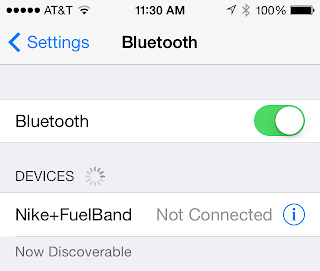 First, go into your Settings app and go to Bluetooth. Tap the little information "i" and tap "Forget this Device"
Now, hold down the button on your FuelBand until the little Bluetooth emblem starts flashing. 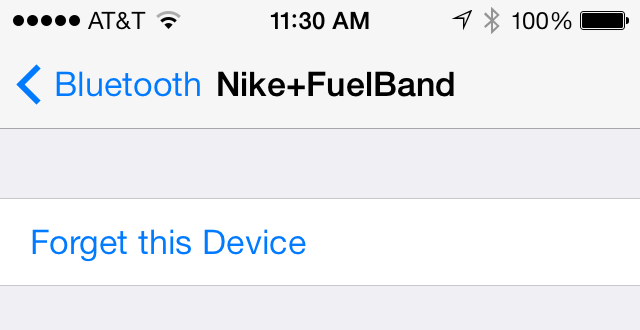 Nike+FuelBand should show up again under DEVICES but it will say "Not Paired" - tap the information "i" again and it will connect with your FuelBand and say "Connected"
Swipe the FuelBand up so that it's cleared. You should now see your fuel showing up again. If this doesn't work, try repeating steps 6-9 a few times. I can't guarantee that this will work but it worked for me and a few friends - hopefully the FuelBand app will get an update soon that will address some of the bugs that this new version introduced.